It is a real pleasure for me to speak at the 'Rise of RMB Forum' co-sponsored by Bank of China and The Banker magazine. · And international economic cooperation. On top of these, RMB internationalisation has taken a solid step forward. Since the pilot program in 2009, with buoyant market demand, cross-border and off-shore RMB business has made marked progress. This has played a huge role in facilitating investment and liberalising trade between China and the rest of the world. · First, China and UK signed a currency swap agreement worth 20 billion pounds. This was the first of its kind between China and any other G7 member. · Second, Britain was awarded the first RMB RQFII quota outside Asia. This quota allows UK based asset managers to invest directly into onshore stock, bonds and equities. · Third, London has the largest volume of RMB business outside Asia. · Fourth, the first RMB clearing bank outside Asia found its place in London. During Premier Li Keqiang's visit in June, China announced China Construction Bank to be the first UK clearing bank for RMB. · Fifth, London is a leader in RMB denominated financial products. In 2012 HSBC issued a two-billion RMB bond. This was the first issuance of RMB bonds outside Asia. In November 2013 the Industrial and Commercial Bank of China issued 2 billion offshore RMB bonds. This was the first issuance of offshore RMB bonds in London by the headquarters of a Chinese domestic financial institution. 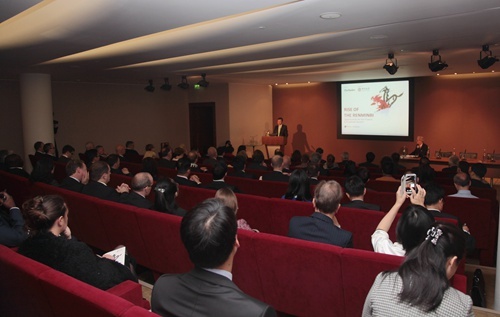 In January 2014 Bank of China London branch for the first time issued 2.5 billion RMB bond as a branch. This offered another quality RMB investment product for British and European investors. · Sixth, on September 12, China Development Bank issued in London a 2 billion RMB bond. This was the first quasi-sovereign bond in London. · Seventh, during the sixth EFD, the UK Government announced its intention to issue RMB-denominated sovereign debt in London. This makes Britain the first foreign country to issue RMB sovereign debt. Income from it will become part of UK's foreign exchange reserve. This makes RMB one of the UK's foreign exchange reserve currencies. Its significance and implication is well beyond bilateral scope. As Chinese ambassador to the UK, I witnessed how London's offshore RMB business has started from scratch and then grown from strength to strength. Looking ahead to the future, I am fully confident about London becoming one of the world's most active RMB markets. There are compelling reasons for my confidence. First, the Chinese economy is making steady progress. This is the engine of RMB internationalization. Internationalisation of a currency depends on the country's comprehensive strength. After more than three decades of reform and opening up, China is now the second largest economy in the world. China has the largest foreign trade and third largest outbound investment in the world. RMB is the seventh largest currency of payment. Yet, given the size of the Chinese economy, RMB internationalisation still has great potential. In the first half of 2014, China's GDP grew by 7.4%. This means China's fast growth has moderated to a more sustainable rate. Economic structure has improved. The growth model has shifted from being led by production factors to innovation driven. Under this new model, the Chinese economy still has strategic opportunities. Reform and opening up has entered a new historic period. This will boost RMB internationalisation and support London's efforts to become an offshore RMB centre. Second, deepening cooperation between China and the UK in a wide range of areas is the corner stone of London's offshore RMB business. Last year, China-UK trade volume exceeded 70 billion US dollars. Now our trade in three days equals the trade in one year more than 30 years ago. Chinese investments in the UK are surging. Combined Chinese investments in Britain in recent three years totaled more than 18 billion US dollars. This was more than the total of previous thirty years. Britain has become the largest destination of Chinese investment in Europe. In particular, when Chinese Premier Li Keqiang visited Britain in June, our two countries signed more than 30 cooperation agreements worth more than 30 billion US dollars. These agreements cover a great variety of areas, such as energy, high-speed railway, finance and investment. London's drive to become an offshore RMB center and the gearing-up of China-UK trade and investment will enhance each other. This will deepen our cooperation and create win-win for our two countries. Third, the top-down design and mass participation is the guarantee of London's RMB business. 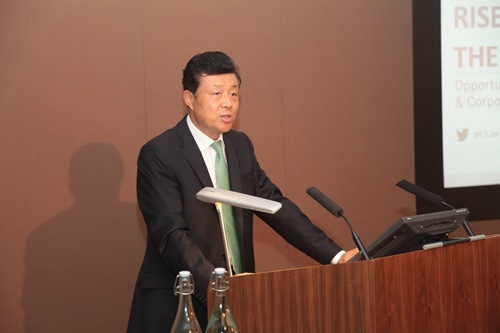 Nurturing the offshore RMB market in London is a long-term and systematic project. 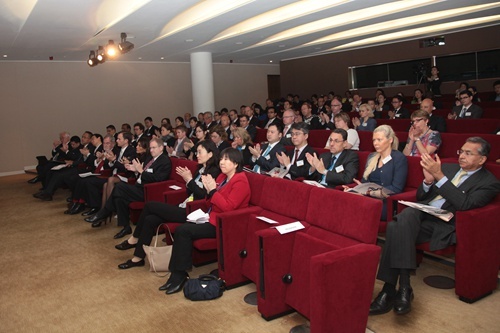 China-UK annual summit and EFD point out the direction for this project at different stages. The recent EFD once again identified financial cooperation as the top priority of China-UK economic links. At the same time we need the participation of market players. Records show that since the launch of RMB pilot program three years ago, British banks and their customers have shown a growing interest in RMB business. Now several major Chinese banks have set up branches in London and issued RMB bonds. These Chinese financial institutions will add new impetus to London's RMB business. Having said the above, we should be aware that RMB internationalisation can not be accomplished over night. It must go ahead in a step-by-step manner. China will deepen reform and open further in financial sector. It is important to follow market rules and adapt to the changes so as to create conditions for China's financial and economic cooperation with the world. I hope Chinese and British financial sectors will seize the opportunities. They must work together to push forward London's RMB business and raise China-UK financial cooperation to a higher level. All these, I believe, will lend a powerful driving force to the China-UK comprehensive strategic partnership.